The Cloud Scout site’s online questionnaire aims to allay SMEs fears over IT security, privacy and data protection. The Commission estimates widespread adoption of cloud computing could boost EU gross domestic product by 160 billion each year, creating 3.5 million new jobs by 2020. But Kroes, 72, would be happy to go beyond digitizing the new EU executive and businesses. “I would like to see a situation where every new European baby is given a birth certificate and also a little piece of the cloud,” she said before adding mischievously her comments had not been cleared by her “people”. Before May’s European elections Kroes extracted a promise from the three leading candidates for Commission President to become “Digital Presidents”. President-elect Jean Claude Juncker made it the subject of a tongue in cheek campaign video, but details of what a digital presidency will mean in practice in the new Commission remain sketchy. Kroes said Juncker must hardwire digital across all Commission departments, making it an integral part of the executive’s strategy no matter the portfolio. While this needed a different mindset, it would not take a miracle to achieve, she said. “It is not only important that we have a digital president in Jean-Claude but that Jean-Claude forms his team with all digital commissioners, not just the one taking over my portfolio,” the Commissioner told EURACTIV. She warned she would be telling Juncker over coffee that he must be “very sharp” on ensuring he had a digital team. Member states put forward commissioners, rather than the executive selecting them directly. And she stressed that some outstanding female commissioners would help, a reference to a campaign by the current eight female commissioners. They are writing to Juncker demanding at least ten of the posts were filled by women. He has asked member states to propose more female commissioners (story here). 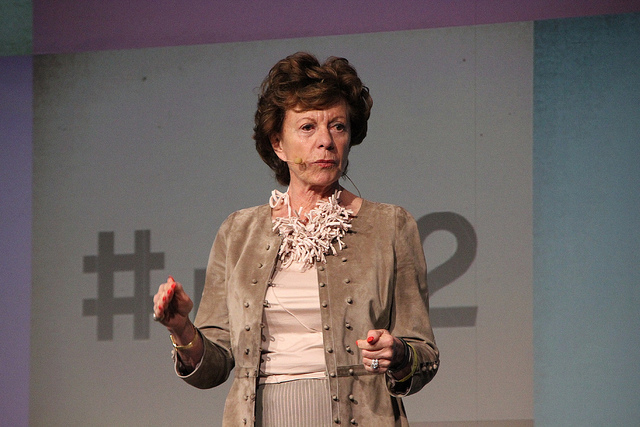 Kroes said that a European digital single market had the potential to bring down the high levels of unemployment in the EU, which she characterized as “an attack on democracy”. The Commission has identified SMEs as drivers of economic growth. Europe has about 20 million SMEs but they have been slower to adopt cloud computing. 23% of SMEs with less than 100 employees remain undecided or unconvinced of its merits. The new Cloud Scout website aims to reassure SMEs, of the value of the cloud, where data is stored using the internet as a shared infrastructure. “The cloud offers organisations huge cost savings and growth opportunities. SMEs are the backbone of the economy so it is vital to get them using cloud computing,” Kroes said. Many SMEs do not realise that the cloud is more secure than traditional servers. “Frequently the reason [for not joining the cloud] is insufficient knowledge. The EU Cloud Scout is designed to help SMEs better understand the advantages as well as the IT security and privacy issues for their business,” Dr Christian Illek said. Illek is Chairman of Deutschland sicher im Netz (DsinN). The company set up a German version of Cloud Scout as a private enterprise last year. Its success led to the creation of the EU Cloud Scout. Launched initially in Austria, Hungary, Belgium, Spain, the UK and Finland, it will be rolled out across the EU in the future. The initiative is being run by CloudWatch Hub, which aims to accelerate adoption of the cloud in Europe. It has received funding through the European Commission’s 7th Framework programme and is a two-year programme, costing €907,121. The service was launched in Brussels by Kroes, DsiN and DigitalEurope, which represents the digital technology industry in Europe. The EU's strategy to help digital technologies, including the internet, to deliver sustainable economic growth is called the Digital Agenda. The Commission estimates widespread adoption of cloud computing by businesses could boost EU gross domestic product by 160 billion each year, creating 3.5 million new jobs by 2020. Europe has 20 million SMEs, seen as important drivers of economic growth, but these small businesses are slow to pick up on cloud computing, which uses the internet as a shared infrastructure to store data. A new website Cloud Scout has been launched to answer SMEs questions about the cloud, which often centre on security and privacy issues. November: New European Commission appointed. Nellie Kroes lives in a pre-NSA internet nirvana. She needs to wake up at 72 and smell the sewers. The priority for Europe should be to develop its own server and connection network that completely bypasses and excludes the USA. This network should be firewalled and encrypted to the highest standards, and only then start working on digitizing the government. This blind naive approach will not just lead to disappointment but to a complete disaster.